The images above and below present the observation that triggered Foucault to contemplating the pendulum setup that is called 'the Foucault pendulum'. Foucault had clamped a rod in the chuck of a lathe, and he twanged it. Then he turned the lathe slowly, and somewhat counterintuitively the plane of swing remained pointing in the same direction. 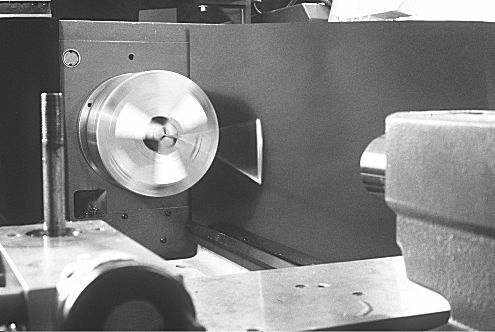 The example of the rod turning in a lathe shows that the momentum of an object is not rigidly tied to the orientation of that object. If the rod is reoriented in space the momentum keeps pointing in the same direction. Foucault's first pendulum was built in his basement, and considering its small size it was a remarkable feat of engineering. A Foucault pendulum is extremely sensitive to very small influences, making it very hard to manufacture a pendulum that actually swings as a Foucault pendulum. To give an idea of the sensitivity: Foucault conducted the experiment runs in his basement at night, for the traffic during the day caused vibrations that would have influenced his pendulum unacceptably. Having seen the first Foucault pendulum perform to expectation Foucault described his pendulum and obtained permission to build a pendulum with a 10 meter wire in the Observatoire in Paris. Foucault's third pendulum was build in the Pantheon in Paris. It had a 67 meter wire, and the 16 centimeter diameter bob was a spherical brass shell filled with lead. Many sources describe the pendulum bob as 'a cannonball', but that is incorrect. There were cannons at the time that took cannonballs of the size of the pendulum bob, but using such a ball was out of the question. The center of gravity of the bob has to coincide precisely with the geometrical center, otherwise there will be a systematic error in the swing. 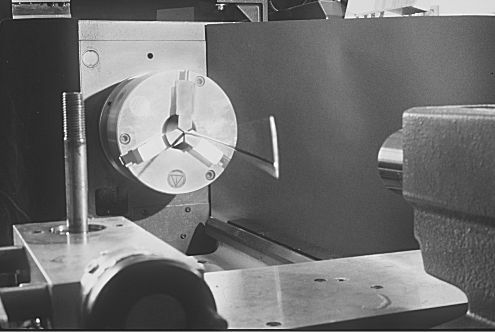 The bob had to be manufactured with the utmost precision. Pendulum mania swept over the world, and the Foucault pendulum has acquired an iconic status. Today, a Foucault pendulum is something of a must-have for a science museum. A Foucault pendulum is deemed to be among the most evocative of physics demonstrations. I think that is because we have an ingrained awareness that when you release an object to motion in a straight line it will keep that line. More generally, we seem to be preprogrammed to believe that objects in a particular form of motion will keep that form. In the case of, say, a marble rolling along a groove that runs in a circle many people are inclined to think that on exiting the groove the marble will continue to move along that circle. That is a wrong expectation of course, but the point is that we certainly don't expect objects to move erratically; we expect them to keep the motion that has been given to them. I believe this is why the Foucault pendulum is so evocative. We expect the motion of the pendulum bob to be along a perfectly straight line. To observe the veering of the pendulum bob from its release direction is felt as a proof that the Earth is rotating. The time it takes a Foucault pendulum to complete a precession cycle depends on the latitude where it is located. The subject of the main Foucault pendulum article is to explain why there is that latitude dependence.